Mind Candy branded non-compliant by ASA for "direct exhortations to children"
A Mind Candy spokesperson has been in touch with GamesIndustry.biz today to explain the unfortunate situation with the ASA, placing the blame on overlooked emails. Mind Candy has now been removed from the ASA's list of non-compliant online advertisers. "It turns out that there was a breakdown in communication and we didn't see the emails pertaining to the issues they had with the site and therefore did not have any opportunity to rectify the problems before the notice was published. Now we have spoken to the ASA and found out where the problems lie we are correcting them and they will be taking down the notice. We take our responsibilities with regards to our fans, especially children, very seriously and would never knowingly ignore the ASA or any directives relating to our responsibilities." The UK's Advertising Standards Authority has named Mind Candy, makers of the Moshi Monster franchise, as a "non-compliant online advertiser" after it failed to respond to or act on its ruling concerning marketing to minors. In August the ASA ruled that Moshi Monsters "presented children with direct exhortations to purchase membership subscriptions in breach of the CAP [Committees of Advertising Practice] Code." Specifically there were issues with elements of advertising like the phrase"Join for Exclusive Member Benefits", the prominent "Join" buttons, and the "Become a Member Now!" text aimed at children. "The ad must not appear again in the form complained about. We told Mind Candy Ltd to ensure that future ads did not state "JOIN NOW" or contain other direct exhortations to purchase membership subscriptions," said the ASA August ruling." A quick look at the Moshi Monsters website today suggests that these elements are still in place. "In the absence of a response from Moshi Monsters, and in the continued presence of the imperative claims on the website, we took the decision on 27 October 2015 to place their company details on this section of the ASA website," said the ASA. 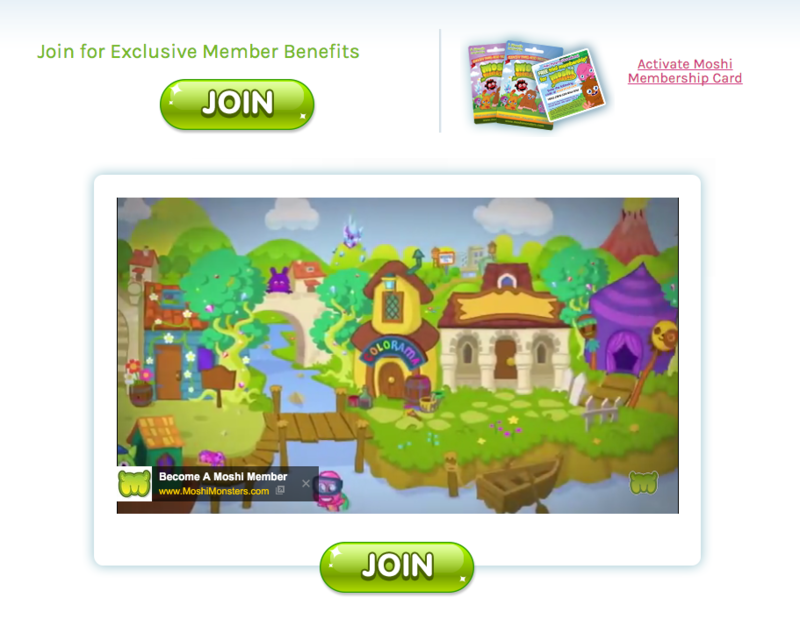 "These details shall remain in place until such time as Moshi Monsters has removed or appropriately amended the claims on the www.moshimonsters.com/membership website to ensure compliance with the CAP Code." GamesIndustry.biz has reached out to Mind Candy for a response to the ASAs actions and will update this story if and when a statement is provided. What's the actual problem being addressed by this? I presume we've not yet gone so far as to make it illegal to sell stuff to children, given all the bloody christmas toy ads apperaring on TV since september. So how come Mind Candy are suddenly the bad guys for selling their stuff? I'd venture a guess that in TV ads geared to kids, those kids still need to ask/beg/be good to get those toys because it's the parents or other adults that buy them. Online in a game situation, I'd gather that same kid can click on something and join up without realizing there's a lot more to it than just clicking on a button. Seems like they may be working on it now or the traffic is bringing their servers down. Their web site is timing out. But that's it though isn't it. Minors shouldn't have credit cards and you can't use pocket money, so begging the parents is the only option. Unless the parents have been grossly irresponsible. 5.4.2 [Marketing communications addressed to or targeted directly at children] must not include a direct exhortation to children to buy an advertised product or persuade their parents or other adults to buy an advertised product for them. 5.5 Marketing communications that contain a direct exhortation to buy a product via a direct-response mechanism must not be directly targeted at children. Direct-response mechanisms are those that allow consumers to place orders without face-to-face contact with the marketer. I agree that children are much more likely to get misled into buying stuff than an adult, and through much simpler marketing tactics, and -whether you agree or not with the validity and effectiveness of the ruling- it seems the best way they found to prevent this is to forbid direct orders (as in "buy! join! ", etc.) to kids, but honest question from a mobile marketing illiterate... How do you do it without getting blacklisted? Or are you supposed not to target kids specifically, at all? Paul, the rules about advertising to children have been in place for w very long time. I think they are broadly a good thing. This shouldn't have come to a surprise to anyone. Although I note that it means that the ASA treat an promotion of your own stuff (I.e. Subscriptions or IAPs) will be treated as ads, and subject to the same rules. Which I think will still catch a few people out. @Rafa: Thanks for that update. Although, it's awesomely hi-larious that kids are correctly deemed gullible and willing to spend any money they get, so protections are needed to keep them "safe". But when those kids grow up into mature folk who binge spend like drunken sailors on home shopping, infomercial and other useless junk they get baited into whipping out their own cards for... well, they're on their own as "responsible" adults. Hah! @John - I think that was just an ironic remark about how adults are sometimes as uneducated consumers as children. Which is spot on, but in any case it would mean we need more education as consumers to not get baited into buying all kinds of unnecesary crap, but nowhere did he suggest we need restrictions. „Ok, Son, but have you calculated those figures against the desired level of patience you are conditioning yourself to? I don't want the game to interfere with that“. „Son, I'm proud of you. Here you go“. I wish the ASA could protect me from Steam sales. How is Valve so good at knowing what I want, then putting it on sale? Craig: it's because you want a lot of stuff. They simply need to get most things on sale at one point or another, and then you'll find plenty of things to buy (and probably put on your pile of "games you'll play one day").